Jackson is a sixteen year old boy who stays out of trouble, does reasonably well in school, has an interest in the arts, but is plagued by an insatiable love of words. His home life is fairly easy, as he has two caring parents, but his father’s declining interest in Jackson and his mother Katherine is a cause for concern for both mother and son. While Katherine tries to rekindle the old flame with memories of good food and fun, Jackson focuses on his impressing his own love interest with his intellect. While studying and avoiding the processed food taking over his house, Jackson encounters an old friend with an interesting gift which enables him to leave reality and enter the narratives of his favourite books. Discovering the power of this new gift may be exactly what Jackson needs to solve all of his problems, that is, if he can first figure out how to get home. 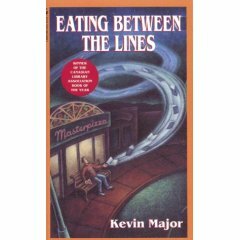 Eating between the Lines is a young adult fantasy novel told from a third-person omniscient point-of-view, and is set in Toronto. The Atlantic Canadian connection in this novel lies with Jackson's parents. The two fell in love with each other while living in Newfoundland. Food: Food represents Jackson's parent's relationship. The allusions of the early years of their relationship suggest that they were part of the "back-to-the-land" movement of the 60s and 70s. The couple’s most memorable times were spent in Newfoundland where they enjoyed cooking and eating fresh foods together. The shift in their relationship occurred when they left Newfoundland for Toronto in order to raise their family. Jackson’s father got a job with a microwaveable food company, and in doing so, his father betrayed his values regarding food, and thus, his relationship with his wife. The relationship continues to deteriorate, not only because of the food, but because of Jackson’s father's need for corporate recognition that he feels he has been left out of because of the time he wasted in Newfoundland. Reviews: Canadian Materials 20 (Jan. 1992): 26; Quill and Quire 57 (Sept. 1991): 57.